Fishing has become more than just a pass time for my wife and I, it has really become a passion, the same can be said about cooking. Food at its most basic level is survival, but it can also be memories, enjoyment, learning and so many other things. We mostly practice C&R when fishing, but occasionally we will take a few fish home for the table, whether it be badly hooked with a poor chance of survival, or a species we enjoy as a treat. The Rainbow Trout is a colourfull, feisty and tasty fish, it is pursued by a variety of anglers for those reasons and many more. Typically they cruise around when hungry, sometimes in good numbers, looking for anything they can get in their mouths. Other days they are sitting on the bottom resting with full bellies not interested in anything you throw at them. I've caught them in fall with a slip bobber and a small jig with worms or plastics, whatever the body of water permits. We have fished for them in winter as well with similar success. Fun to fight, a beauty to look at and delicious when prepared correctly. caught them in fall and began to drill some holes and find depths. Light action rods with 4 lbs line and small jig heads with assorted baits was our plan of attack. We were using one line each because when the trout hit they take it fast and if you aren't quick they can get hooked badly in a heart beat. Not owning a flasher yet, we started letting the jig fall all the way to the bottom and then working our way back up, slowly jigging and dead sticking one foot areas at a time until we got some bites, most of which were 1 -2 feet off the bottom. 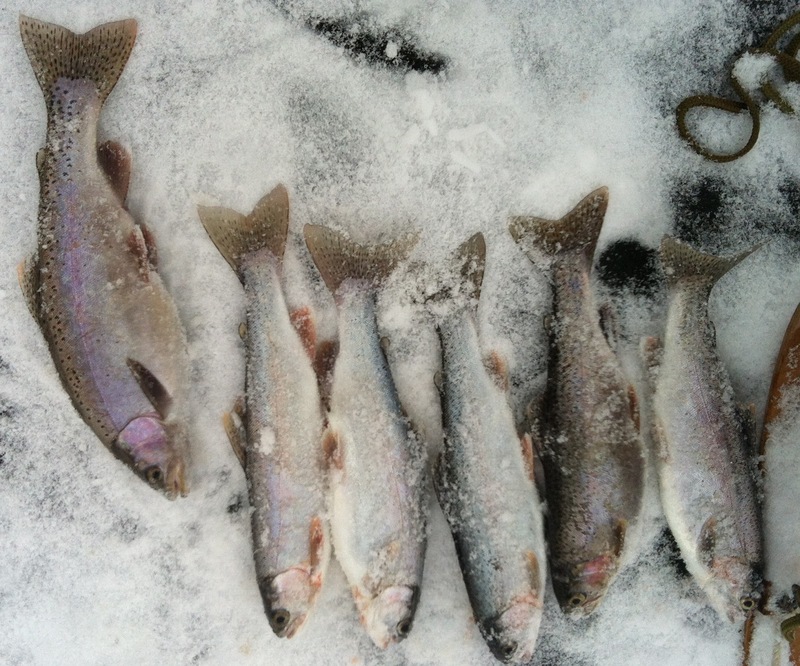 Once the trout depth was zoned in on, we had a pretty good morning. Most of the fish caught that day were hitting the bait on the drop down quite aggressively. At one point when I would catch one, my wife would drop a jig down the same hole while I was taking the hook out of the fish and BAM fish on, it worked with our friend trying it out as well. All but one fish came out of the same hole, and my wife and I were both able to catch our limit with many others released as well. Anyone that has caught a rainbow before knows that they are very resilient fighters and can tear all over the place down there. Some days they are smacking your offering on the way down, others they need a very still bait to induce a strike. Sometimes less is more when jigging for them. When fighting one, once you have reeled it just under the ice, keep tension on and when their face is in the middle of the hole, either grab the body as it just breaches the water or "chub" it out and away from the hole. This is one species I have taken to getting up and looking down in the hole once I've set the hook, it has increased my success. Back at it a few weeks later, the ice was thicker and day a little colder. After hauling our gear to our spot, we punched some holes in a few shack formations and set up shop. It wasn't long before my wife had a nice rainbow iced fit for the frying pan. 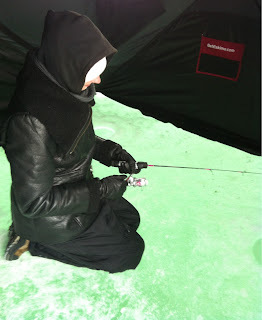 It was a slower day than our first outing, overcast skies, ten below zero with a foot of ice and some snow cover. 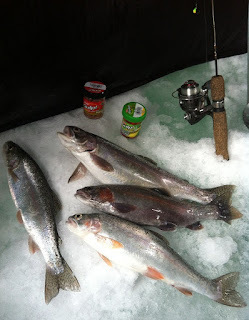 The fish didn't seem as hungry as a few weeks ago although scented plastics and frozen minnows were both producing well, we kept our presentations small in hopes of targeting eaters and not trophies. After a great day on the ice it was time to head home and enjoy a meal with friends and family. catch, I've been known to cut open a stomach or two when cleaning to see what they were feasting on. 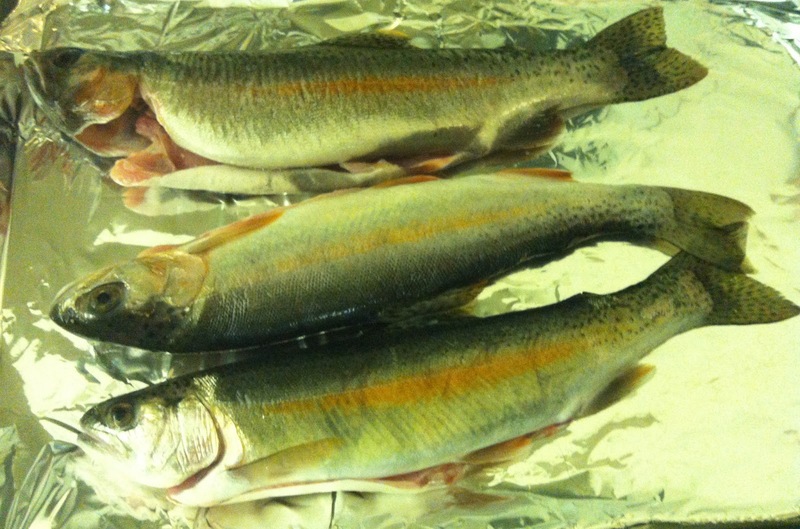 Trout are great scaled, gutted and steamed whole or pan fried, here are some fairly easy step by step recipes. I cannot take credit for the recipes below, but have tried them and enjoyed them immensely. 2 Scale, gut and cut out the gills of the trout. Saving any roe sacks for caviar or bait. Also take some time to cut along the side of the spine so the fish will lay butterflied on the baking sheet. 3 Cut up 2 green onions in 1 inch pieces, a few slices of ginger cut into strips and a small handful of cilantro. 4 Cut up a few slices of any kind of bacon, we used home made having just slaughtered some pigs. 5 Line baking sheet with aluminium foil and pour a small amount of soy sauce and cooking wine over it. Place half of the green onions, ginger, bacon and cilantro where the fish will lay. 7 Pour some more soy sauce and cooking wine over the fish and add remaining green onions, ginger, bacon and cilantro, then cover with tinfoil and put in a 350 degree oven for 25 - 35 minutes depending on size. 8 Remove from oven and enjoy! The skeleton should pull right out, the rib cage on the cut side should peel off easily as well and don't forget to try the cheeks and collars. The taste of this fish is accented and enhanced with these ingredients and not overpowered when done well. 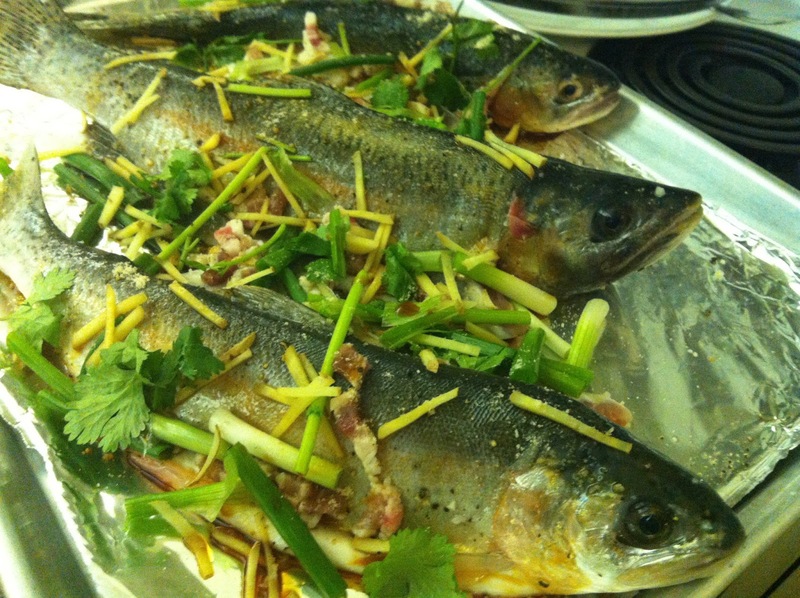 If fish head on makes folks at the table squirmy, this recipe works just fine with out them. (heads or folks you decide) The above recipe works nicely with walleye and salmon as well and can be done on the barbecue. After cleaning a trout and finding some roe sacs, I did some research on making caviar which turns out isn't that tough and totally worth the effort. I've enjoyed it on crackers with cream cheese, with fish and on home made sushi. I usually like to store it in the fridge and use it up within 7 days, it freezes well in little jars and has been great a few months later. There are tons of people that spend a lot of money on caviar and it really does make for a tasty treat for special occasions or packed along for a snack on your next ice fishing trip. 1 Mix the salt and water until the salt is all dissolved. Get a large bowl of ice water ready. 2 Soak the roe sacs for 20 minutes in the salt water in the fridge. 3 Get the faucet running with water just about as hot as you can take it, roughly 100-120 degrees. Lay a fine-meshed sieve in the sink. contract and the eggs will fall out into the colander. Take your time and be gentle here. Repeat with the other skein. 5 When all the eggs are in the colander, dunk the eggs in the bowl of ice water for 5 minutes, then return the eggs to the salt water brine. 6 Rest in the fridge for another 15-20 minutes. Any longer and they will be very salty. 7 Gently pour out the water and let the eggs drain in the sieve for 15 minutes. 8 Pour into a clean glass jar and refrigerate for up to 3 weeks, but they will lose quality over time. Waste not, want not, we do our best to respect the land we fish on, the fish we release and the fish we eat.